1. 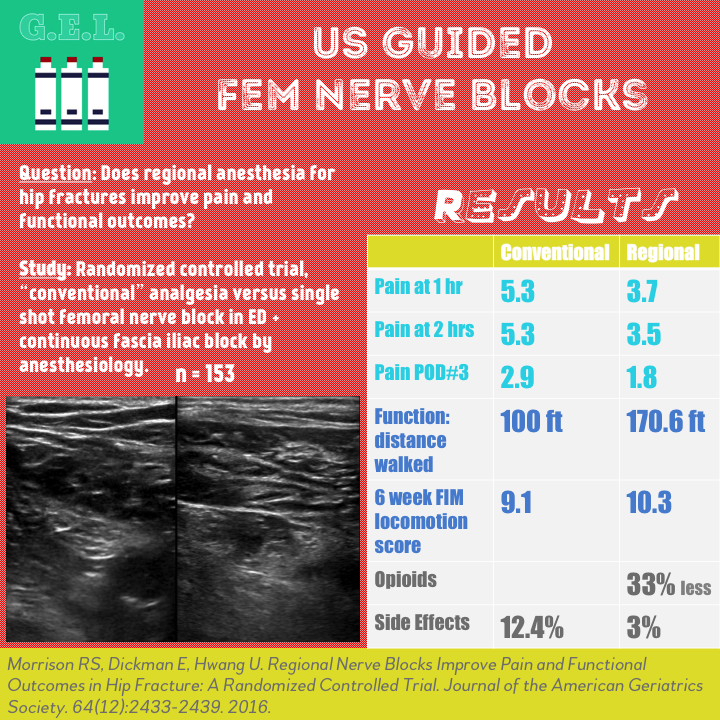 A single shot femoral nerve block in the ED followed by anesthesiologist-performed continuous regional anesthesia is a feasible method of pain control in hip fracture. 2. This method of regional anesthesia resulted in better pain control, less opioids and related side effects, and better functional outcomes compared to control. Hip fractures are common. More than 250,000 adults over 65 years old are hospitalized for this annually. There is significant risk for loss of functional outcomes for this population (only 50% recover their ability for activities of daily living, only 54% can walk unaided after 1 year). Pain limits recovery and is associated with postoperative complications, less physical therapy, worse function. Opioids are not ideal for pain due to side effects. Regional anesthesia has been proven to be a great alternative. This is where ultrasound comes in. Besides anesthesiologists, most providers would likely not be comfortable performing landmark or nerve-stimulator guided peripheral nerve blocks. Ultrasound has made this much safer and easier. Does the use of regional anesthesia for hip fractures improve outcomes in pain in the emergency department, pain and function postoperatively, and pain and function 6 weeks after discharge? Does the use of regional anesthesia for hip fractures decrease opioid requirements and side effect incidence? Since this was a bundled treatment (ED single shot block + catheter) it is unknown which component is most important. Exclusion of those with advanced dementia who might have benefited most from non-opioid therapy. Functional benefits seen may not be specific to regional anesthesia, but could be a result of the superior pain control. The resources and time invested in this pain control approach was not compared to the traditional approach. Setting up this type of protocol requires interdepartmental cooperation and communication.